Southern Colorado Farming and ranching is the main income source for the San Luis Valley. Potatoes, barley, and wheat are the main crops but also grown here are carrots, alfalfa, lettuce, broccoli, canola, and cauliflower. Ranching of sheep and cows are another industry found here. 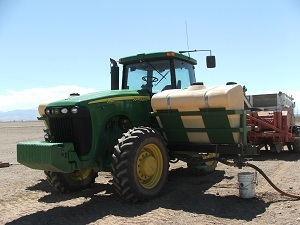 Southern Colorado Farming in the San Luis Valley takes place at an elevation of 7,500 feet or higher. The area is considered a desert with an average of only seven inches of annual precipitation. 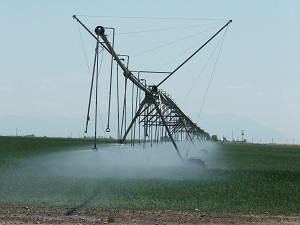 With so little precipitation farmers rely on snowpack in the Sangre de Cristo and San Juan Mountain ranges to supply water to the ancient underground water aquifers. From these aquifers, center pivot sprinkler systems pump water to supply farmers’ crops. Irrigation is still seen in some areas with canals and small ditches which provide water from local rivers to the farmers/ranchers for their water usage. Southern Colorado Farming in the San Luis Valley is varied. We recommend you take time to drive down an county road and see what is growing. From the time the crops are planted in May, to harvest, the area is full of activity. Don’t forget your camera so you can capture first hand where some of your food comes from! It is not uncommon for some of the San Luis Valley farms to be in the same families for over 100 years as heritage is very strong with generation after generation continuing farming and ranching practices. The difference in farming techniques have changed drastically throughout the generations as children attend colleges, many receiving degrees in agriculture, then coming home to farm/ranch the family business. Equipment has developed and become very sophisticated during the past twenty-five to thirty years. Now tractors have GPS systems installed to assure straight rows when planting and are some are equipped with satellite radio for the enjoyment of the driver. Some area farmers have begun to plant all organic crops but many of the larger farmers use different forms of chemigation to prevent diseases and bugs from ruining the crops. Look for crop dusters which often stray chemicals on the crops in the Valley as you pass through. It is worth your time to stop and watch the aerial display as these crop dusters avoid power lines, trees, center pivot sprinkler systems, and watch the weather as they do not spray when the wind picks up. Don’t miss seeing the Amish farming operation while visiting the San Luis Valley. It is so captivating watching their farming techniques using horse drawn equipment. In the modern day life of so many farmers using tractors with such high tech equipment, it is heartwarming to see an old life style of using horses for their true “horse power”. One of the main crops of Southern Colorado Farming is potatoes. They are also the area’s biggest cash crop. There are approximately 50,000 acres of potatoes grown annually and around 20 different varieties. The first potatoes were grown in 1882 and 90% of Colorado’s potatoes come from the San Luis Valley. 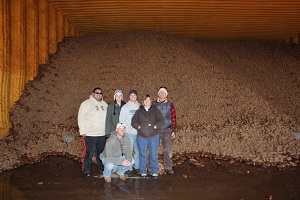 This is our family standing in a cellar full of potatoes. Hopefully this shows you what bulk potato storage looks like. . . a mountain of potatoes! The summer temperatures in the San Luis Valley are ideal for growing potatoes. The potatoes are unique in flavor and texture which can be attributed to the cool nights and warm days. A great way to learn about potatoes is the Annual Monte Vista Potato Festival. To begin the day there are buses that take you to the Colorado Extension Research Center and several farms to get an up close view of potato harvest. Back in Monte Vista there are potato cook-offs, potato games like sack races and peeling potatoes, as well as many other fun activities. 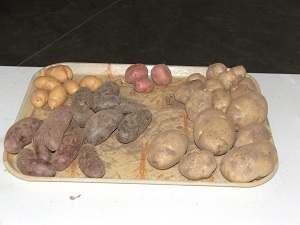 It is a great way to learn about potatoes and see harvest first hand. 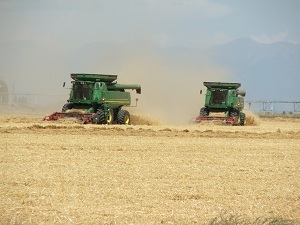 Another main crop for Southern Colorado Farming is barley and wheat. The farmers began planting barley every other year in rotation with potatoes to help put nutrients back into the soil and reduce weed growth. 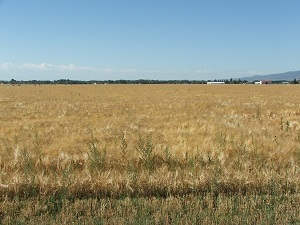 The San Luis Valley specifically grows malt barley which is supplied to Coors Brewing Company to make beer. There are very strict tests that the barley must meet in order to be used by Coors Brewing Company. These include the proper moisture content, protein, damaged and broken kernels, or mold. If the barley does not pass it is usually sold for feed barley at a much lower price. Alfalfa is another viable crop to Southern Colorado Farming. The Valley is a major hay-producing region and the crop is second behind potatoes as the Valley’s most valuable crop. 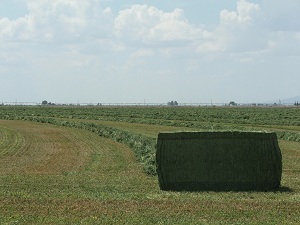 Once alfalfa is planted, the farmer generally leaves the alfalfa in the ground for five to seven years. 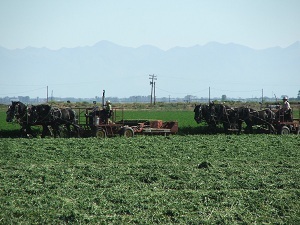 When the alfalfa is removed from the ground it is a valuable time to plant potatoes because the alfalfa leaves many nutrients behind in the soil which the potatoes thrive on. By doing this it will increases the potato yield significantly. Southern Colorado Farming also includes lettuce, carrots, canola and a small portion of broccoli and cauliflower. Mushrooms are grown indoors at the Rakhra Mushroom farm outside of Alamosa. Lettuce is planted by machinery but human employment is required to weed, thin, and harvest the crop. 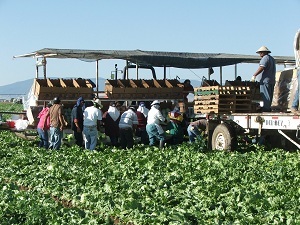 Planting of the lettuce begins around May 1st and the lettuce is harvested in stages from mid-July to October. Carrots are usually a contract crop grown by local farmers under a contract with Grimmway Farms who lease the land, plant the carrots, and harvest them in the fall. The farmer is to make sure the crop is irrigated and Grimmway provides everything else. 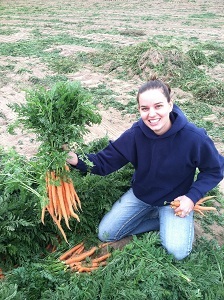 The harvest of carrots if really fun to watch and the field is full of the bright orange carrots! 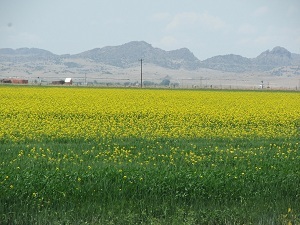 Canola is very distinguishable by its bright yellow blooms across the entire field. Often bee hives are placed near a canola field as the blooms attract so many honey bees to the area. Haefeli’s Honey located in the town of Del Norte turns the bee’s hard work into delicious honey. Don’t miss an opportunity to enjoy their store and purchase their honey. While the mushrooms are grown indoors the smell is not containable. The decaying smell of the materials used in growing the mushrooms can often be smelled for miles. If you are in Alamosa and notice an unusual, yucky odor it is probably the Mushroom farm.